Texas Tech University Health Sciences Center El Paso President Richard Lange, M.D., M.B.A., and Vice President for Outreach and Community Engagement J. Manuel de la Rosa, M.D., M.Sc., accompanied representatives from the university’s Vietnamese medical school partners to the International Meeting on Simulation in Healthcare on Jan. 28. The conference, held in San Antonio, Texas, was sponsored by the Society for Simulation in Healthcare. The medical school partners are from the University of Medicine and Pharmacy and the Pham Ngoc Thach University of Medicine in Ho Chi Minh City, Vietnam. The IMSH Presidential Gala featured a celebration of the accreditation of the simulation centers at the two universities. This accomplishment is a result of the efforts of Clinical Professor of Medicine Hoi Ho, M.D., founder and director of TTUHSC El Paso’s Collaborative Education Program, an international faculty development initiative. 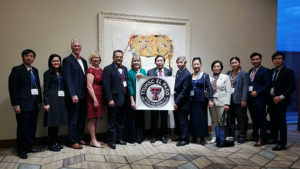 Dr. de la Rosa said the successful partnership with the Vietnamese universities will help lay a foundation for more international community engagement initiatives through the TTUHSC El Paso Office of Outreach and Community Engagement and the Office of Diversity, Inclusion, and Global Health.